Halloween is a time of ghosts, goblins, and all things spooky. It's also a time where we can eat as much free chocolate as we want without needing to feel guilty! 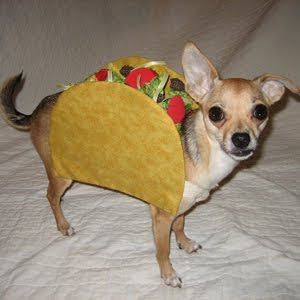 However, Halloween can quickly turn into a nightmare for you and your pet if they ingest chocolate. Chocolate is toxic to dogs, cats, and most other pets. It contains a chemical called theobromine which, in large enough quantities, is toxic and even fatal to pets. Before you let your dog or cat convince you to offer up a taste of your Snickers bar, make sure you read up on chocolate toxicity to get all the facts. Here are some great articles to get you started. Trick-or-Treat with the big cats this Saturday! 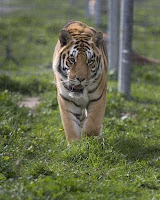 Wisconsin Big Cat Rescue will be open for trick-or-treating this Saturday, October 31 from 3:00pm-6:00pm. All 27 big cats will be "handing out" candy to visitors. There is no admission fee, though donations of any size are appreciated. Attention Kids: 2nd Annual APPA National Children’s Pet Poetry Contest! For the second year, The American Pet Products Association (APPA) is holding a pet poetry contest for gradeschool children grades 3-5. Participants are invited to write a poem about their favorite pet and why they love them. Entries can be submitted online or by mail to Pets Add Life, 45 Winter Street, Reno, NV 89503. All entries must be received by January 15, 2010. Two winners from each grade level will be selected to receive a supply of pet products. Their classroom will also receive a $1000 scholarship to help further pet-related education. The clock is ticking, so kids....happy writing! Check out the website for all the contest details. Help the Dane County Humane Society win big! We all know how much the Dane County Humane Society does to help homeless pets in the greater Madison area. Now, help give back by making them a winner in the Animal Rescue Site $100,000 Shelter Challenge! You may vote once per day until December 20, 2009. Make sure to tell all your friends to vote (retweet this if you can!) and bookmark this post so you can remember to vote every single day. Through the Shelter Challenge, the Dane County Humane Society has a chance to win up to a $20,000 grand prize; weekly awards of $1000 can also be won. Please help support your local Humane Society by voting every day! It's quick, easy, and will help infinitely to care for homeless pets in our area. Click the banner to vote! A final pre-trial is scheduled for tomorrow, October 15, 2009, in the matter of a Madison man accused of holding cockfights. Jorge L. Iglesias was charged on June 26, 2009 with 13 felony counts of instigating animal fights. Jorge Iglesias entered a plea of not guilty on all charges during his June initial appearance hearing. A jury trial is scheduled for November 3, 2009 in the Dane County Circuit Court. If you have a dog (or just plain love dogs! ), you'll feel right at home at the Wisconsin Dog Fair. Held on November 8, 2009 at the Alliant Energy Center in Madison, the event features vendors, exhibitors, raffles and more. Over 150 different dog breeds will also be available for viewing. On Saturday night I took my hedgehog Laika out of her cage for her evening playtime. I noticed that she had a very strange lump on her back leg right at the quill line. It hadn't been there the day before, so I had my husband rush Laika and I to the emergency vet at about 8:00 at night. The vet's first impression was the same as mine: it's probably an ingrown, infected quill. He decided to aspirate the lump. If it was filled with liquid, it should shrink quite easily. Unfortunately, the aspiration proved it was not filled with liquid but rather solid tissue. I should find out the university's results later today. For now, I'm just keeping my fingers crossed that my sweet little hedgie girl will only have a minor removal surgery to endure. Enjoy Barktoberfest this Sunday in Cambridge! * ...and much, much more! Barktoberfest is sponsored by Rover Makeovers. In the Fall of 2002, my husband (then boyfriend) and I moved to Madison, WI for college. Having grown up with cats my entire life, our new apartment seemed dull without a furry little friend to meet me after a long day of classes. One day, we decided to check out the stores in the vicinity of our local mall, and we noticed a nearby PetSmart. I told my husband that if there were cats there, I would like to look into adopting one. Somewhat opposed to the idea, my husband said, "If there are cats, we can look at them, but we’ll only get one if his name is Gabe." Thinking he had laid the whole cat issue to rest with such a one-in-a-million demand, we went to have a look inside. Much to his dismay, there were indeed cats for adoption at PetSmart. We approached the cages only to discover that most of the cats were having an afternoon snooze. There was, however, one cat pawing frantically at the cage. My husband squinted to look at the name tag, and as luck would have it, the tag amazingly said "Gabe." True to his word, my husband hailed the attention of a store employee who got Gabe out of the cage for me to hold. When she placed him in my arms, he hissed and scratched my arm to the point of drawing blood. We both decided that, fate or not, Gabe would not be coming home with us after all. A little dejected, I turned around to leave the adoption area. As I was about to walk out, the store clerk grabbed my hand. "Did you meet Tinker?" she excitedly asked. She opened up the cage directly to the left of Gabe's and handed me a soft, beautiful and purring Siamese mix. She had radiant blue eyes, tabby striped paws and calico ears. Her markings were completely original; almost funny, as though she had been crudely designed from the markings of ten different exotic cats. I held Tinker in my arms for nearly 15 minutes as the store clerk told us all about her past. She was a stray from Delavan, WI where she was found wandering the streets. She had no way to fend for herself or find substantial food, as her owners had declawed all 4 of her paws. She suffered from severe ear mites when she found herself at the Lakeland Animal Shelter, but they were all taken care of by the shelter vet. One look at my husband, and I knew he felt the same as I did: Tinker was coming home with us. When we picked Tinker up from the adoption center a week later, we immediately took her to the vet's office for a check-up. All of the vet techs absolutely adored Tinker and couldn't help but give her treat after treat. When they attempted to hear her heartbeat through the stethoscope, they were unsuccessful as her loud purr was too overwhelming (she never ceased purring when amongst company). The veterinarian came in to examine Tinker and remarked about the strange way her eyes seemed to dart back and forth as though she were reading an invisible script. He suspected that perhaps she had an inner ear infection, but this was not the case. He left the room and returned a few minutes later with a thick medical book in his hands. Reading from the book, he explained to us that Tinker had a condition common in Oriental cat breeds called Congenital Nystagmus. The condition caused no issues for her and did not compromise her vision in any way; her eyes simply darted back and forth comically. Her nystagmus proved to be just another unique feature of her already unique appearance. At this point, we expected nothing less from our little anomaly. We took Tinker home, where she immediately settled herself in. Within an hour, she was sleeping in my lap. She also slept in bed with us that same night, beginning the nightly occurrence of Tinker sharing a pillow with me and often snoring directly into my ear (I’d often wake up some nights with her paw in my mouth). She continued to charm us and visitors to our home for the next six months as the only cat; the Queen of the Household, a task she took very seriously. Those six months later we encountered another misunderstood Siamese mix at a local shelter. His name was Shamrock, and he was scared and thin from months of being generally mishandled by well-meaning folks that didn’t necessarily understand the gentle and emotional temperament of the Siamese breed. Though Tinker was content as an only cat, we couldn't bear to see Shamrock at the shelter. From the moment Shamrock came home with us, he would be known as "Gabe." Tinker and Gabe did not have an easy acclimation, to say the least. For Gabe, it was love at first sight. For Tinker, Gabe was simply a pest that needed to be eradicated. He would touch noses with her; she would bite and tackle him. So it went for several months, during which Gabe took to stress-licking his fur to cope with the rejection. My husband and I resigned ourselves to the fact that Tinker and Gabe may never be friends, but simply co-exist as neutral roommates (Gabe's fur grew back as he also resigned himself to this fact). Therefore, it was incredibly surprising when the day finally came that Tinker decided to jump up onto the couch to lay by him. It must have surprised Gabe too, because he let out a confused meow and ran from the room! After a few more unsuccessful attempts by Tinker, Gabe recognized that she was burying the hatchet and allowed her to lay by him. They became fast friends from that point on. Gabe and Tinker were inseparable from fall of 2003 until the beginning of 2009, when Tinker was diagnosed with renal failure. Her disease was advancing more quickly than we could control, and the veterinarian did not have optimistic expectations for her long-term survival. When Tinker came home from the vet's office after we received the news, Gabe uncharacteristically hid upstairs for nearly a week. If Tinker approached him, he would avert his eyes and slink away. He knew something was wrong; terribly wrong. She slowly regained her strength and Gabe slowly warmed back up to her. Things went back to normal for a few months, as we tried to push the severity of Tinker's illness from our minds. In April of 2009, Tinker took a turn for the worst. She stopped eating solid food and would lay unmoving in one spot for hours at a time. Her once-silky coat became dull, and her eyes had lost the bright, glimmer of joy that they always held. As unprepared as we were, my husband and I knew it was time to say goodbye. Through a steady stream of tears and sobbing, I held Tinker in my arms while the veterinarian mercifully put her to sleep. As her body lost strength and went limp, I whispered in her ear how sorry I was and how much I loved her. I really hope she knew. Tinker was a beautiful, loving and wonderful friend to me, but she was also so much more. She represented my first foray into adulthood. She was there when I ventured into the big city on my own. When I began college. When I got married, started my career and bought my first home. When everything around me was changing, I could always count on Tinker to ground me; to remind me of the constants in life. She was my life preserver, my confidant, my pillow and my rock. When I lost her, I felt like the most important phase of my life had come to an end. However, I also knew that in moments of such sorrow, one needed to move on in order to stay afloat. Nowadays, when I come home from a nasty day at work, I’m still met by Gabe, who is still as loving, vocal and gentle as ever. And whenever I’m feeling down and wish that Tinker was around for me to hold, I can look at photographs and instantly remember what it was like to hold her at the PetSmart for the first time. To look into her eyes and know, beyond the shadow of a doubt, that we were going to make each other’s lives better. And we did. We both did. Teach your kids a lesson about friendship with the delightful children's book Roy and Kitty. The book features over 40 full-color photographs (every page is full-color!) following the main characters Roy (a dog) and Kitty (a cat) as they form a very unlikely friendship. The story is told from the animals' perspective and in their own words. Young readers will enjoy the easy reading and adorable photos, as will pet-lovers of any age. Roy and Kitty is written by Dane County author Bill Vancil. His previous work includes Don't Fear the Big Dogs, inspired by his battle with prostate cancer. Vancil is also the editor for My Dog Magazine and owns the webdesign company Vancil Creative in Cross Plains, WI. Keeping an indoor cat enriched is not as simple as providing food and a clean litterbox. It takes consistent interaction and mental stimulation to keep indoor cats truly happy. Join Dr. Tony Buffington on October 11, 2009 from 11:00am-1:00pm to learn more about this topic, part of the speaker's Indoor Cat Initiative. Dr. Buffington will speak for one hour, followed by social time and a question & answer session. Ever wish you could bring your favorite pet with you wherever you go? Though that’s still not a possibility for most people, there is a way to have the next best thing: a photo handbag! If you’re like me (or most women), you don’t go anywhere without your handbag. It’s more or less your traveling studio apartment. It carries your wallet, your keys, your checkbook, your makeup…the list goes on an on. Since your handbag goes everywhere you do, why not make it a unique way to show off your pet? Photo handbags available through SnapTotes are fun and practical. They are available in many different styles, from diaper bags to classy clutches. Depending on the style you choose, your bag can be customized with different trim, various fabric styles, color choices, and much more. You can even choose to have your photo display on both sides of the bag for some designs. Adding a photo to the bag is easy. SnapTotes has a simple uploading tool to choose a photo right from your computer. If your favorite photo isn’t available digitally, you also have the option of mailing a hard copy in to the company. The way your photo displays on the handbag is totally up to you; you can zoom in, zoom out, adjust the placement, etc. SnapTotes even has a tool that allows you to create a collage of multiple photos if you just can’t choose a favorite. 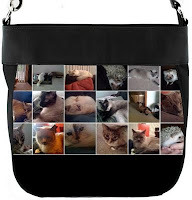 A customized photo handbag is a great gift idea for pet lovers (I know I’d love to be given one!) It’s a gift that is not only practical, but totally personal. SnapTotes also offers photo pillows in addition to their wide selection of handbags. A photo pillow is a thoughtful gift idea for college students leaving home, frequent business travelers, and anyone else who could use a little reminder of their beloved pet. There is also a men's collection which includes messenger bags, photo wallets, and more. Visit SnapTotes online for more information. Use discount code couptote09 for 15% off any order over $50, or use code greatbags for 10% off an order of any size.